Written by Chuck Dixon with art by Wil Rosado, G.I. Joe #8 concludes the Cobra Civil War as the contestants make their final moves and The Council chooses the new Cobra Commander. Without giving too much away, we have a satisfying ascension of power by one of the candidates. While the winner may not have been a surprise to most of us, there are plenty of reveals in the story to keep us interested. On the other hand, the Joes have never been so low since the start of the series. In eight short issues, they have gone from being barely aware of Cobra's existence to being fearful of them, and their own existence is now being threatened for perceived incompetence by governmental officials. 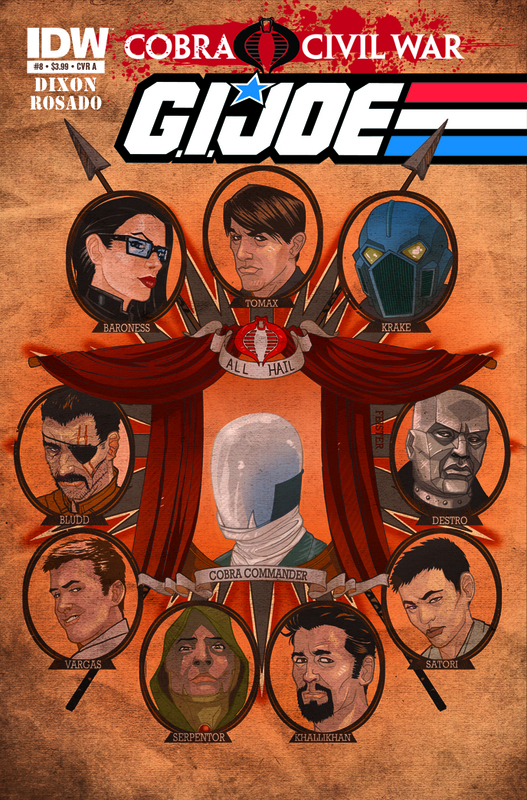 In fact, Dixon underscores both the similarities and polar opposition between the Joe and Cobra power structure by cutting from Hawk's grilling by his high command to the naming of the new Cobra Commander by the Council. The strength of the issue lies not in the conclusion of this storyline, but the laying of the framework for the next one. Cobra is empowered with new leadership and Joes are struggling for existence and on the run in their own country. Dixon leaves me looking forward to the next issue and the next arc. The new Commander is revealed to be clever, manipulative, resourceful, back-stabbing, and able to play the long game. These are all characteristics that made the Marvel Commander such a formidable and respected antagonist, and I'm looking forward to see more of the same from IDW's new Commander. Speaking of playing the long game, Serpentor makes another welcomed appearance. I find this incarnation of Serpentor (first introduced in the last Cobra II series) the most intriguing yet. On the other hand, Destro really has not been that well developed since the launch of the IDW series, and has been notably absent during these eight months of CCW storyline. Here's hoping, with his brief cameo at the end of this issue, that he will start to get the attention and development he deserves. This issue represents one of Wil Rosado's better efforts, with consistently great art from beginning to end. The cynic in me wonders if Rosado spent extra time or effort on this issue knowing that there would be some minor media attention because of the Cobra Commander reveal. Regardless, this is the type of art I expect from Rosado, and I was happy to see it this issue. A special shoutout to Robert Atkins for his beautiful redesigned Commander suit. I love the alternative covers IDW had done this month, with vintage and 25th Joe figures and vehicles gracing the cover. This is one of the few times I've actually sought out variant covers. Dixon gives us a strong conclusion to the Cobra Civil War story as well as making us anticipate the next story, Cobra Command. Highly recommended.